What a very big day for a very big boy! Donald Trump, a very big boy who has very big hands (and also a very big job! ), had a very big day today. First, he got to talk to a man from the TIME magazine, who is doing a big story about lies, and for some reason, wanted to talk to Mr. Trump specifically about them. The man asked some mean questions and tried to make it sound like Mr. Trump had fibbed, but it was all worth it, because it will help big boy Donald Trump have even more pictures of himself on the TIME cover than someone named Mr. Nixon! 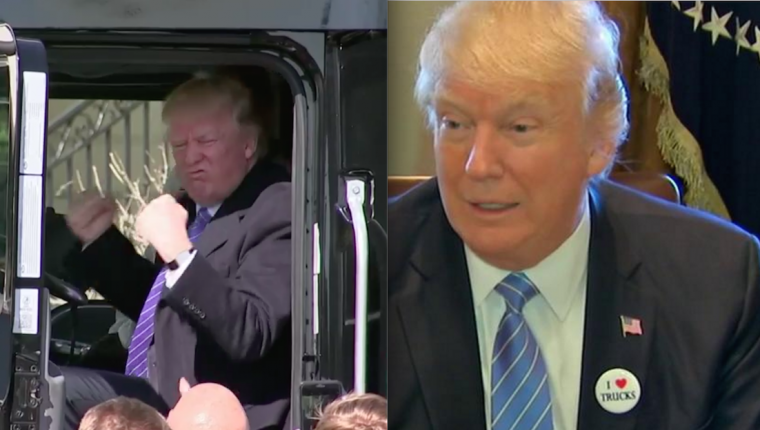 Then the real fun started, as our nation’s biggest and most powerful boy got to sit in an actual, real-life truck! Right up front! Right where the driver sits! And guess what? The truck driver let him honk the horn! YEAH-HUH, I SWEAR IT!!! JUST WATCH!! The “[Heart]” means “love!” Mr. Trump loves trucks! Mr. Trump liked the pin so much that he put it on his big boy suit, right below his red, white, and blue pin. The red, white, and blue pin has lots of stripes on it, and Mr. Trump is not sure why there are so many stripes on it, but he’ll probably know one day, once he’s all grown up. Grown-ups know so much stuff about so many things. But don’t worry! Mr. Ryan says the test will be very easy, because all Mr. Trump has to do is sign the paper, and then he passes! Also, there might not even be a test! Mr. Ryan lives in a house, and he is trying to get all of his friends in the house to pass the test over to Mr. Trump, but they might not, and even if they do, first they’ll just pass it on to some other people in a different house, who might also not pass it on to Mr. Trump… Like I said, it’s all very complicated! Anyway, unnamed sources have leaked that the president ended his very big day by excitedly recounting his myriad activities to White House strategist Steve Bannon, while Mr. Bannon tucked the president into his big boy bed. “And I got to be on the cover of TIME, just like Nixon, and I got to sit up front in a big rig, just like a real trucker, and I got to honk the horn and everything, and I got a pin that says ‘I love trucks,’ and, and, and…” the president reportedly stammered, before yawning and suddenly realizing how sleepy he was from his very big day. Mr. Bannon reportedly smiled and nodded, pulling the blanket up to Mr. Trump’s chin as the president drifted off to sleep, muttering softly that he would like to be a real truck driver when he grows up, because truck drivers don’t have to know so much about numbers and taxes and medicine. Anonymous sources also confirmed that when Mr. Trump wakes up tomorrow, Mr. Bannon will fix him two toaster strudels and allow him to watch three hours of his favorite show, “Fox and Friends,” as he prepares for his next big day. Mr. Trump is just seventy-and-a-half years old, and already he has gotten to do so much! Every day is a new adventure for America’s Big-Boy-in-Chief.